inscription: The bottom edge center has: "Great American Historical Moments / Copyright 1975 Figi/Wilson Giftware Corp., San Diego, CA U.S.A. / Design/D. Wilson". 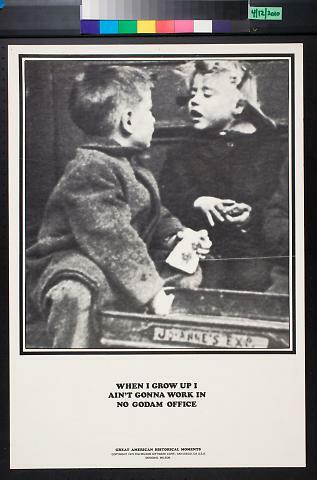 The top of the poster has a large black and white photograph of two children, a young boy at left and a young girl at right. The children are looking at one another and both appear to be speaking. In the foreground is a toy wagon that has the text: "Jo - Anne's Exp.". The picture is bounded by a thin black border. The bottom of the poster has the text: "When I Grow Up I / Ain't Gonna Work In / No Godam Office". Verso has images of other posters from the publisher.